Chancellor George Osborne took time out from a busy election campaign to visit the yard at Story Contracting and speak to some of our apprentices before heading up to the new Story Homes head office to mark the official opening. The Chancellor visited the yard at Story Contracting’s Burgh Road depot in Carlisle and got the chance to learn about the recent investments in our machinery. Story Contracting invested in six new A900 CZW RRVs at the end of last year, a key part of the business plan for the next 2 years. Mr Osborne got the chance to see one of the machines in demonstration and understand how this has ultimately led to more local jobs. The visit comes as Story Contracting celebrates one of its most successful years to date, recently featuring 33rd on the Sunday Times BDO Profit Track 100. Story Contracting’s workforce currently stands at 412 and continues to increase with growing teams in Cumbria, Yorkshire, Edinburgh and Glasgow. 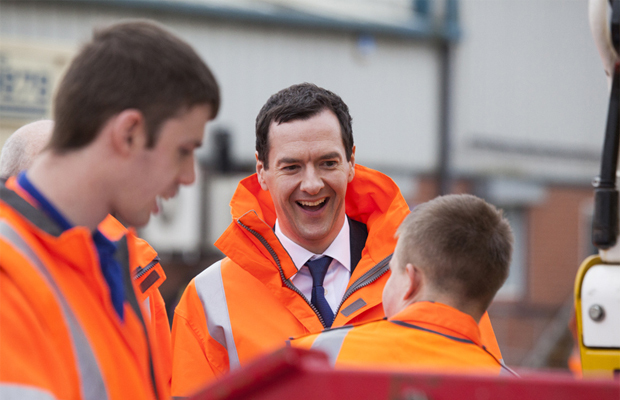 Mr Osborne went on to open Story Homes’ new offices at Kingmoor Business Park which cost £3m to refurbish and upgrade. Work began last April by Story Contracting’s Construction division and took 14 weeks to complete. The refurbishment of the former headquarters of Carlisle’s RAF 14MU base is currently home to 95 Story Homes staff but offers the capacity for the company to expand to a workforce of 120.